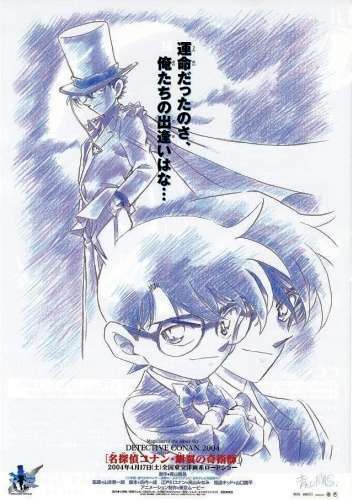 Once again, Kaitou Kid crosses swords with Conan Edogawa in this annual installment of the Detective Conan movie franchise. After receiving a letter from the thief, famous actress Juri Maki seeks the help of private detective Kogorou Mouri to protect the Star Sapphire—the "Jewel of Destiny," said to represent faith, fate, and hope. Thinking he has deciphered Kid's riddle, Kogorou personally shows up to the newly constructed space theater where Juri is acting in the play "Josephine" in order to catch Kid in the act. The next day, Conan and the gang are invited by Juri to her holiday home, to celebrate the thwarting of Kid's plan and the success of the play. However, their triumph crumbles when a murder occurs during the flight there. Although unintentional, this sets off a series of events that escalate to catastrophic results. Conan and Kid, unlikely allies that they are, must work together to save both their friends and every other passenger aboard the plane.